Flip SlideHD Camcorder Giveaway for Father's Day! Is Dad still capturing family videos on an old-school VHS camcorder? Or is he letting those moments slip by entirely? The Flip SlideHD allows anyone to capture life's moments and easily share those experiences with friends and family. The all-new Flip SlideHD has a new form factor, designed to make it even more fun to capture, watch and share HD videos anytime, anywhere. With Flip SlideHD, you can record up to four hours of HD video, or store up to 12 hours of content, and then view it instantly on the camcorder's unique slide-up 3-inch widescreen. Like all Flip models, the SlideHD is pre-loaded with the proprietary FlipShare™ software that allows you to easily organize, create and share videos. Using a PC or Mac, Flip video content can be instantly uploaded for private or public sharing. From social media sites – Facebook, MySpace and YouTube -- to email, mobile devices, Flip Channels, and the TV. 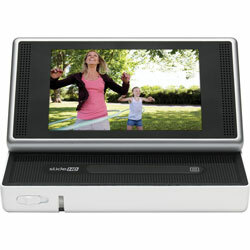 Enter the Flip SlideHD giveaway for a chance to win your own Flip SlideHD ($279.99 MSRP) to capture that special moment! Then, tell us in a comment below what you would do with the Flip SlideHD if you are picked as the winner! Maximum of one entry per person. The giveaway will end at 11:59pm on June 11th, 2010. Hello! I’m Amanda, I have subscribed and I’m very excited about this giveaway. It will definitely make someone very happy so good luck everyone! If I were to win this, I don’t know I would just be very surprised, but I would use it for independent film making. To make short films that make statements we all need to hear, to make an impact. subscribe to the Techlicious newsletter & it’ll go with me to Thailand this summer! I have one grandson, Gabe, and I cannot get enough of him we got to have it. My granddaughters are very funny and the still digital camera I have does not capture all of their charm. Would love to win this. I would use it to film the kids on vacation. My granddaughter will be doing a school project next fall that requires filming her activities. This camcorder is something she could definitely use, so I’d be giving it to her. I would keep it so I can record all of my sons football games this fall! There are 4 babies in our extended family - with the latest arriving just this week - and we can’t wait to share pictures with their cousins and aunts on the east and west coasts. I LIVE IN HOUSTON TX. WOW I WISH I HAD A FLIP SIDE THE THINGS THAT GO ON SHOULD BE RECORDED.NEVER BORING HERE…. I’m a subscriber. I’d love to surprise my Dad with the Flip Camcorder this summer, especially because my family’s surprising him with a trip to Niagara Falls for his birthday, and it would be amazing to let him document our first family trip in years with such a high-tech camera. Thanks for the chance! What wouldn’t I do with a flip camcorder? I would use it to take recordings of all my friends. I would use it to take video of our times at home having fun. I would also fulfill my dream of filming videos for YouTube, and posting them. Love to use it on our first big trip to Disney Wolrd! I am (slowly) becoming a photographer and would love to use this as an extra thing to offer to people is their events video’d. i would take videos of my kids. I would use it for capturing my kiddos in all their cuteness, birthday parties, holidays, concerts, sport events, plus for adding videos to my website. I subscribe to the newsletter - AND I would let my sweetie have it as a Father’s Day gift and then take videos of our personal history! let the camera row filming the life of a dog in a day or my husband, who having more fun!! I subscribe and I would use this camcoder to capture all the wonderful and sometimes funny things my daughter does. I would love to use the Flip Slide HD to capture memories of the family and school events. I would love to use it to videotape my niece’s wedding later this summer. I’m an 8yo cancer survivor whose cancer came back and want to save all the memories I can!! Everyday is a day to be celebrated!!!!!!! This would be a great gadget to use the next time I run over to a friends apartment to rush her to the hospital. Live footage of rolling a LIVE body on a NYC Luggage cart would have been a great way to post it on line! Keep up the good work & Happy Anniversary on 1yr! i would like to win this because i need a new camcorder to record everything our new baby does. I would use it to capture the kids and dogs- and to make our #SummerBash on the blog even more spectacular and stunning for our readers’ pleasure. I would use it at my wedding as a prop, or to record the event! I would like to film my son’s sports events. I’d take the SlideHD everywhere with me so I could catch all those little moments. I’d love to have the Flip Video recorder, and would definitely use it to record all of the crazy summer antics of my two little granddaughters! We’re moving from NY to TX…I’d record our relocation, new sights and friends. I’m a subscriber…and if I won this I would share it with my son, he’s had his eye on one for a long time now! I am a subscriber and we are planning a vacation in a few months and it would be so great to take with us!! I would cary it with me to catch those obscure moments to share with friends and family. subscribe&would; use it for my sons first football game this year! i would use for the grand kid’s recitals! susbcriber. we are going to curacao in a couple of months and we want to record our adventure. I’m a subscriber, I would love to own this to tape all of the celebrations and trips we have planned this summer, thanks for the chance!